I recently returned from Chicago where I spent the week with a group of students from Allegheny College’s Newman Association. In this day and age where many people see service to another as an obligation and not an opportunity, I was proud to be with this wonder- and faith-filled group. All of this goodness and self-sacrifice helps to fill the world with hope. The tasks that the students accomplished were perhaps not monumental in the eyes of the world, but I’ll tell you, in the eyes of those they served, the work was huge. There was a tremendous amount of gratitude, joy and hope in the students’ eyes and in the eyes of those they helped. During this next week, take a look at how many opportunities you have to give of yourself and to give hope to another. It is often the small things that can have a big impact on ourselves and others. Keep your eyes and heart open to see what God has in store for you this week. P.S. If you're interested in short- or long-term volunteer opportunties with the Sisters of the Holy Family of Nazareth, check out our Service Corps page. 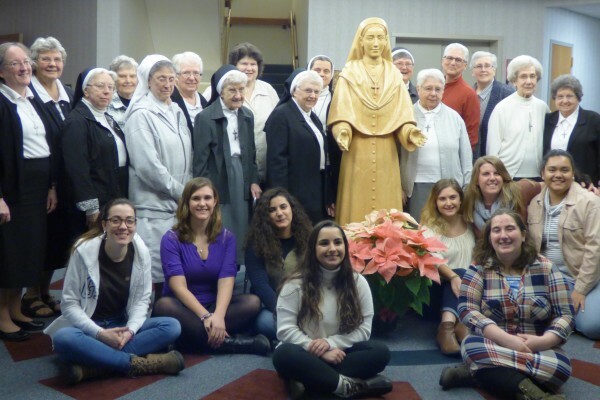 Photo of this year's volunteer group with our sisters.